A couple of weeks ago. the giant Military collectible , “show of shows” was held in Ky, the state I live in. 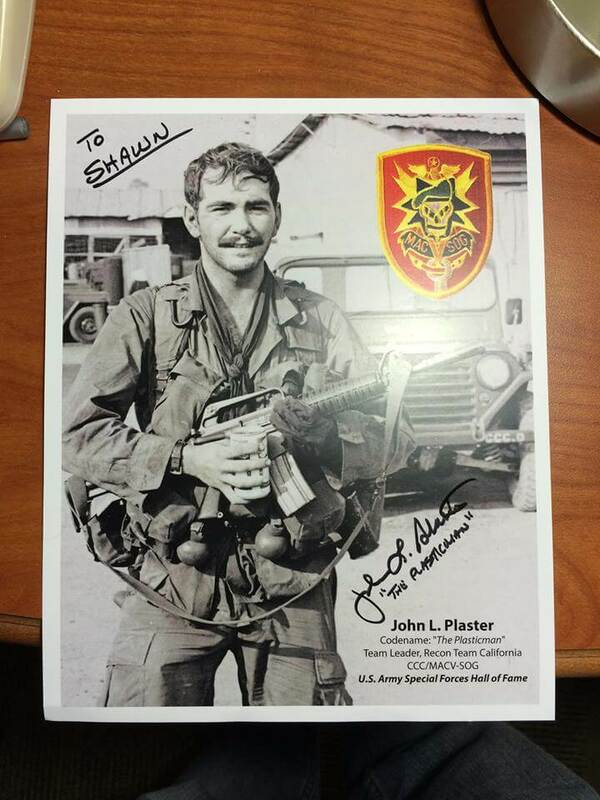 Among other distinguished guests of honor, including Medal Of Honor recipients, was Major John Plaster. Major Plaster is the writer of The Ultimate Sniper and several books on the history of MACV-SOG and his experiences while in SOG. 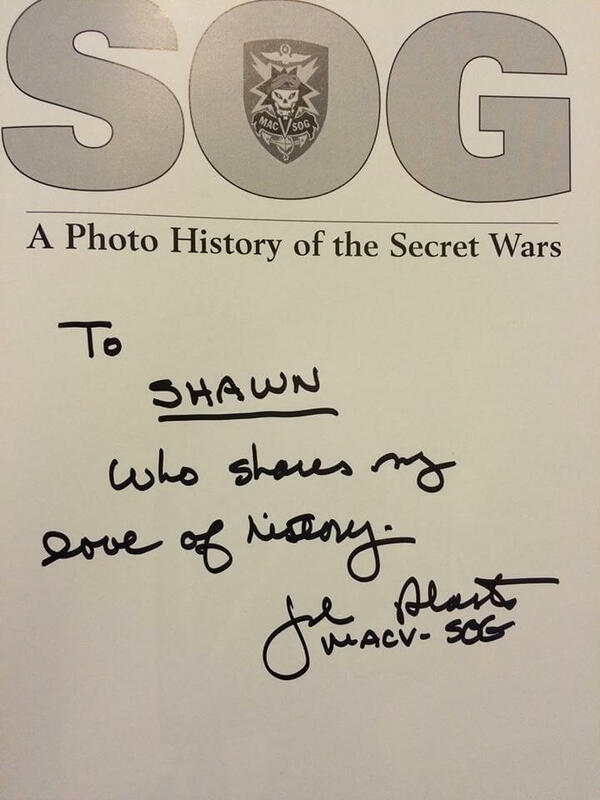 I bought the fist book he wrote on SOG in the mid 90s and had a copy of his excellent sniping manual before that. It was a real pleasure and honor to meet the famous One-Zero. He not only autographed this picture, but also a copy of his Photo History of SOG. 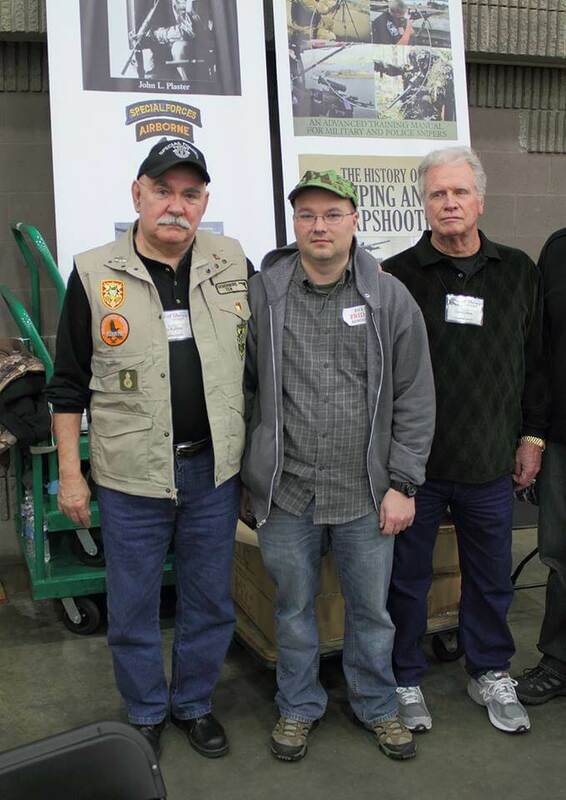 To my surprise, he also got his fellow former SOG One-Zero, Larry White to autograph the book on the page Mr. White’s picture during the war, appears on. To me, that was the sign of a great guy. He was really awesome and asked me if I wanted a picture with him and Mr. White. The Major is on the left, and Mr. White on the right with the hideously deformed writer in the center trying not to look intimidated by the legends who were kind enough to be seen with such a oaf. While I wish we would have these legends with us for many many years, sad to say they are leaving us to recon the after life. If you have a chance to meet these heroes, you should take it. We do not know how much longer we will have the honor of their being among us. One note I would like to make is the actions of some of the men who stood in front of me to meet these guys. They demanded too much in my opinion. The gentleman did not have to be there and the jack asses asked for book after book to be signed. Obviously to make there way on to Ebay within the hour I had no doubt. And they treated these men like it was a zoo. intruding upon them, especially the older WW2 veteran MOH winners. I did not over stay my welcome nor push it. When I saw the older WW2 guys getting tired, I did not do more than shake hands and thank them. I know we all get excited by meeting these legendary heroes, but when you do get there, remember to treat them with respect and courtesy and pay attention to body language and be sensitive to their needs.